The Chinese have launched the Chinasat-11 (Zhongxing-11) communication satellite via a Long March 3B/E (Chang Zheng-3B/E) rocket on Wednesday. The launch took place at 16:06 UTC from the Xichang Satellite Launch Center, in the south west region of China. Zhongxing-11 has a lift-off mass of around 5,000 kg and a design lifetime over 15 years. The satellite is based on the DFH-4 manufactured by the CAST (China Academy of Space Technology) and features multiple high power fixed and mobile beams and transponder switching capability. It will provide services for commercial broadcasting and communications via 45 C-band and Ku-band transponders, aimed at meeting the needs of Direct-to-Home, data transmission, digital broadband multimedia and streaming media for clients in Asia, Africa, Australia – whilst covering large regions of China Sea, Indian Ocean and Arabian Sea. 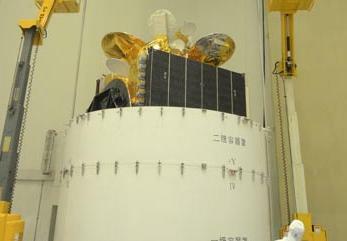 As was the case with Zhongxing-12 (ChinaSat-12) – launched on November 27, 2012 – part of the satellite’s communications payload has been leased to Sri Lanka, co-branded as SupremeSat-II. In 2012, SupremeSat has entered into a partnership agreement with CGWIC (China Great Wall Industry Corporation) for the design, manufacturing and launch of the SupremeSat-III satellite, a deal that also secured the marketing facilities of many other satellites owned and operated by CGWIC and the China Satellites Communications Corporation. SupremeSat-III will be based on the DFH-4 platform, to be positioned at 50 degrees East Longitude, once launched by a Long March 3B/E launch vehicle. The CAST manufactured DFH-4 (Dongfanghong-4) platform is a communications satellite bus featuring high capability and a long operational lifetime. It sports an output power and communication capability equivalent to the similar international bus specifications, and consists of propulsion and service modules, solar arrays and 3-axis stabilization. The applications for the DFH-4 platform are not limited to high capacity broadcast communication satellites, with the ability to be used as tracking and data relay satellites and regional mobile communication satellites. The spacecraft has a payload capacity of 588 kg and an output power of 10.5 kW through to the end of its lifetime. The satellite is equipped with three receiver antennas and two transmission antennas. The DFH-4 satellite also features mitigation hardware to counter hostile jamming. 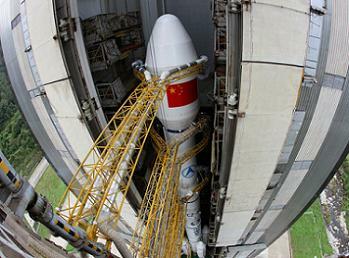 China’s second launch of 2013 was also the 176th successful Chinese orbital launch and the first from Xichang this year. A total of 78 orbital launches have been conducted out of Xichang. Developed from the Chang Zheng-3A, the Chang Zheng-3B is the most powerful launch vehicle on the Chinese space launch fleet. The Apstar-7 launch was the 23rd flight of CZ-3B and the 55th flight of CZ-3A series launch vehicles. The CZ-3B features enlarged launch propellant tanks, improved computer systems, a larger 4.2 meter diameter payload fairing and the addition of four strap-on boosters in the core stage that provide additional help during the first phase of the launch. The rocket is capable of launching a 11,200 kg satellite to a low Earth orbit or a 5,100 kg cargo to a geosynchronous transfer orbit. The CZ-3B/E (Enhanced Version) launch vehicle was developed from the CZ-3B, increasing the GTO capacity up to 5,500kg. The CZ-3B/E has nearly the same configurations with CZ-3B bar its enlarged core stage and boosters. On May 14, 2007, the first flight of CZ-3B/E was performed successfully, accurately sending the NigcomSat-1 into pre-determined orbit. With the GTO launch capability of 5,500kg, CZ-3B/E is dedicated for launching heavy GEO communications satellite. 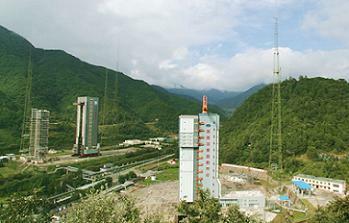 The Xichang Satellite Launch Centre is situated in the Sichuan Province, south-western China and is the country’s launch site for geosynchronous orbital launches. Equipped with two launch pads (LC2 and LC3), the centre has a dedicated railway and highway lead directly to the launch site. The Command and Control Centre is located seven kilometers south-west of the launch pad, providing flight and safety control during launch rehearsal and launch. The CZ-3B launch pad is located at 28.25 deg. N – 102.02 deg. E and at an elevation of 1,825 meters. Other facilities on the Xichang Satellite Launch Centre are the Launch Control Centre, propellant fuelling systems, communications systems for launch command, telephone and data communications for users, and support equipment for meteorological monitoring and forecasting. The first launch from Xichang took place at 12:25UTC on January 29, 1984, when the CZ-3 Chang Zheng-3 (CZ3-1) was launched the Shiyan Weixing (14670 1984-008A) communications satellite into orbit.